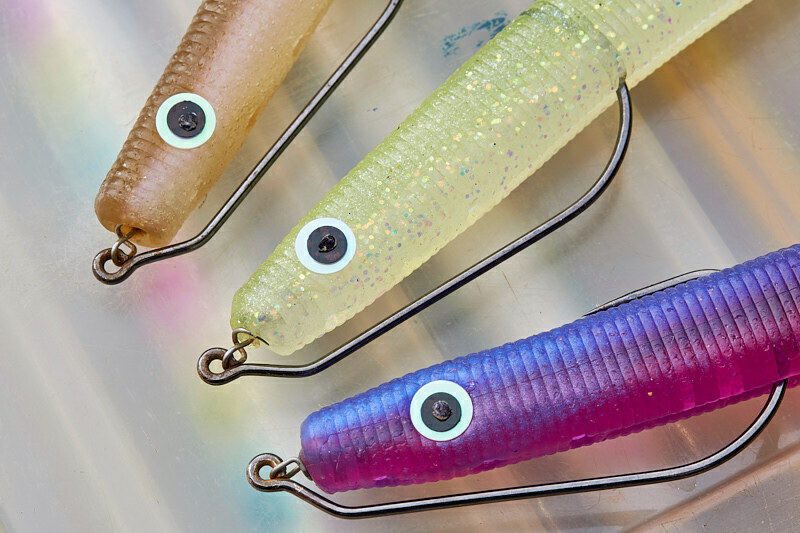 Please bear in mind here that I am not trying to tell you that adding eyes to soft plastics which don’t already have them is going to catch you any more fish, but then I go and look at my hard lure collection and they all have eyes on them already. Mackerel have eyes, sandeels have eyes, baby pollack have eyes, prawns have eyes. And so on. This adding eyes thing was just me looking around, thinking about things, and having a bit of a play more than anything else, but as with so much in fishing there surely has to be the what if factor here………..
And then I stumbled upon this video above on YouTube. Now I don’t know if the bloke in the video thought of this way of adding eyes himself or whether he has kindly made an easy to follow instructional video on an established method, but after trying to add some eyes to a 6’’ DoLive Stick with superglue and it not working properly at all, I came across this video, bought some sequins, and gave it a go. The results are below, and if I can do it with my lack of DIY skills then I’d suggest that there are ancient bacteria dwelling at the bottom of a primordial swamp which could do so as well. Hell, anything not to be putting superglue near my fingers and having to cut them apart with a knife - and that can’t just be me, surely? As I said, adding eyes to something like a DoLive Stick or a senko or whatever might well make no difference at all to catch rates, but I thought that some of you here would find this at least vaguely interesting. If it’s any help, I bought some cheap as chips 6mm white/holo and 4mm black sequins on Ebay as per the bloke describes in the video. If nothing at all it’s a bit of a wind up with fishing mates when they see a DoLive Stick with eyes and ask me where the hell I got it from. You all have a good weekend.